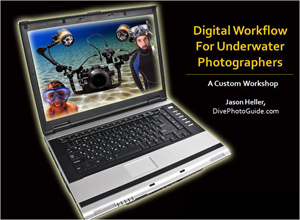 I’m presenting a digital work flow presentation to the New York Underwater Photographic Society on Sept 2nd. Although the seminar is geared towards underwater photographers, it focuses on issues and approaches that are common for all digital photographers. More information can be found on the NYUPS website. Recently I have become a huge fan of Lightroom. The 2.0 release really stepped up the software and it has become my primary workflow and editing tool. Granted, there are still plenty of reasons to go into Photoshop, but I’d say that 75% of my work is now being done in Lightroom. For me, the less time I can sit in front of a computer editing and the more time I can focus on shooting, the better. I have a 5 minute rule. Basically it goes a little something like this…If in 5 minutes you can’t get your image to 80% of where you ultimately want it to be, then it was not captured properly in the first place. Of course the additional 20% may take a lot longer, but I’ve found that the 5 minute rule is a good one. Like most things in life, photo editing follows the Pareto Principle (aka “the 80/20 rule”). The seminar will focus on the steps of workflow from capture through backup, displaying or selling your images.